ReDsNoTDeAd and 1 Guest are viewing this topic. 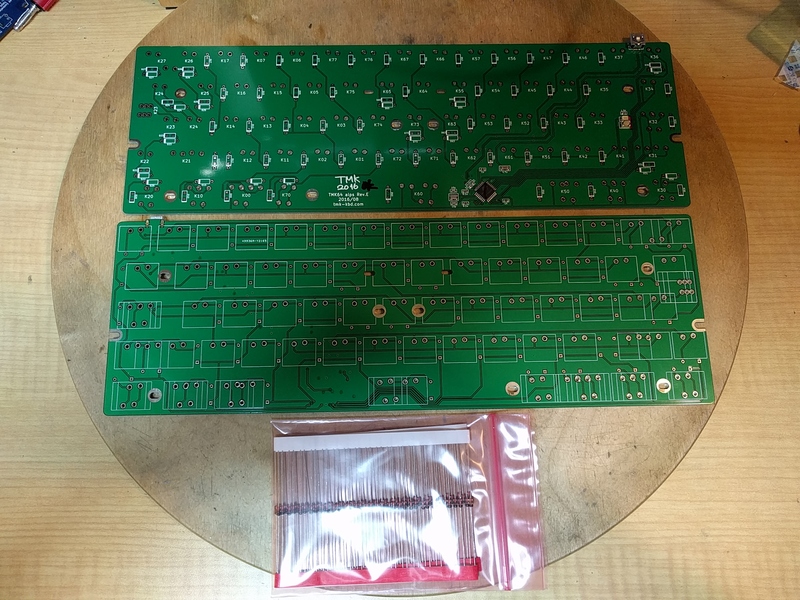 TMK Alps64 PCB supports ALPS SKCM/SKCL and compatible switches and various layouts including old vintage keyboards, such as Apple Extended Keyboard, Dell/SGI 101 and more. You can harvest switches, keycaps and stabilizers from the old keyboards. And the PCB can be screwed down into de facto Poker compatible cases. WIth this PCB you can make 60% keyboard from your favorite ALPS switches. This is my Alps64 with SKCM orange switches and AEK keycaps. It looks like the below and curent revsion PCB color is black. All SMT components are soldered, through-hole diodes(1N4148) come with the pcb and you have to solder them yourself, and swiches of course. See 'Assembly' section below. You can use this plate instead of buthchered vintage AEK plate. Its material is FR-4(PCB substrate) and color is black. You can use keycaps and stabilizers from AEK(Apple Extended Keyboard) or AEKII with this plate. Note that this plate supports only AEK US layout only. Current plate design(2018/05) supports also "flipped space bar" and Dutch AEK space bar, see this post. For other layouts than AEK check "Plate" section below. The PCB and plate are in stock on regular basis and you don't have to ask me about their availability. Status below will be updated if they are out of stock. 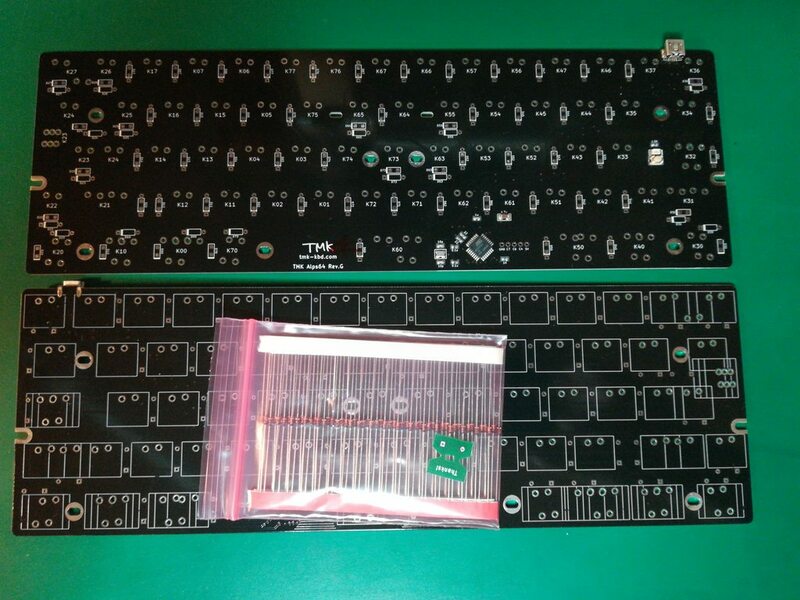 To place order email me( hasu@tmk-kbd.com ) with "Alps64 Order" in subject and let me know number of PCB and/or plate. You don't have to PM me, you don't. $6USD for world-wide shipping. Always 6USD for any number of PCB/Plate. I'll send you PayPal invoice, you can pay with credit card or balance of PayPal account. Please make sure you supply correct shipping address when making payment. Sorry to say this but we had very long delay on delivery in Canada these days(April 2017) and it takes even two months occasionally when you suffer from bad luck. In the case of trouble you have to wait two months(plus a week) before having me issue fully refund. If you are in Canada consider using EMS for shipping method, which is traceable and very fast(3 days or so) but it costs 20USD instead of 6 Let me know if you want to use EMS. 03/25 Paid for all of nine slots! 05/27 Found defect with ISO enter on Rev.A. Fixed on Rev.B. ISO Enter key can be used in Rev.B and later revision. The PCB supports three mount positions, 1u, 1.25u and 1.5u. See pictures and figure below. Matias has 1.25u mount, Dell and Alps have 1.5u mount and ISO Enter with 1u mount is not confirmed its existence yet. By the way, Cherry ISO key is also located in middle of 1.25u as Matias does. AEK ISO layout is not supported, which is different size from standard ISO layout. Caveat: AEK ISO layout is not supported, which is different size from standard ISO layout. - TEX aluminum case OK OK but some diodes may interfere with thick PCB supports of the case, perhaps you need this trick in that case. - IQUNIX LAMBO OK but it may make short circuit. Open source CAD files of plate are available here. You can order a plate using these CAD file instead you cut down plate of vintage keyboard. 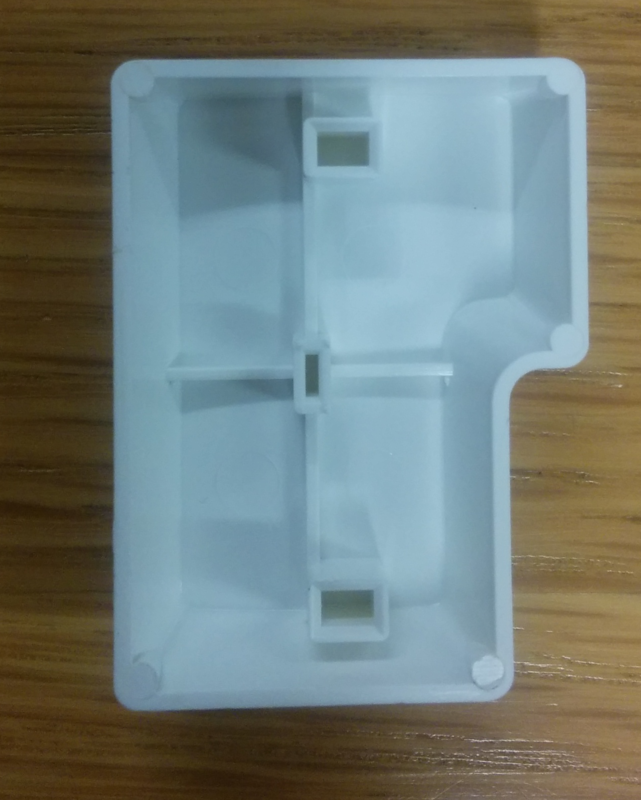 Plate thickness for Alps switch should be 1.0-1.2mm according to its spec. My latest AEK layout plate design files are available here. Use 'alps64_plate_aek_flip_spacebar.dxf' to order from laser shop. Seems that many have used lasergist.com recently(around 46 70USD for AEK plate) but any other laser cut service will work. Other alternative would be laserboost.com of Spain, which has 1.2mm thick from the beginning. They require 37 €(44USD) for the plate, see this post. You can edit keymap and download firmware without compiling here. You can also build firmware yourself from souce code, of course. To comipile your firmware consult with TMK documentations and resources. See this for building firmware from source code first. Alps64 firmware is built with enabling those options by default. For Caps Lock key just use 'KC_LCAP' instead of 'KC_CAPS' in Keymap Editor or your keymap code, for example. Test your PCB before you start assembling. If you assemble it without this test and it doesn't work it could be very difficult to discrimitate between PCB's fault and yours. You will see LED on bottom side flashes at startup. And it will be enumerated as a keyboard device by your OS. 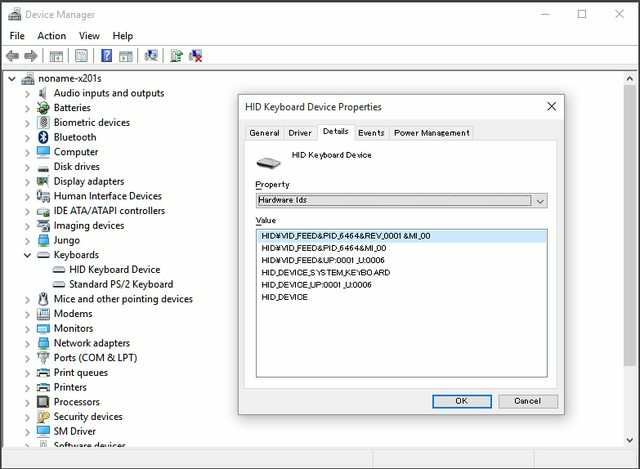 In Windows you will find a entry like 'HID Keyboard Device' whose hardware id is like 'VID_FEED&PID_6464' in Device Manager. and lines like below in log file such as /var/log/kern.log(ubuntu). Connect pads of K01 and D01 with tweezer or papler clip like pic below. You will see 'm' is registered on Notepad. This indicates your PCB is likely to work well. If your PCB doesn't work as described above it may have fault, post your problem in this thread. See BlueNalgene's this post also. Diode has polarity and won't work if you solder it reversely. 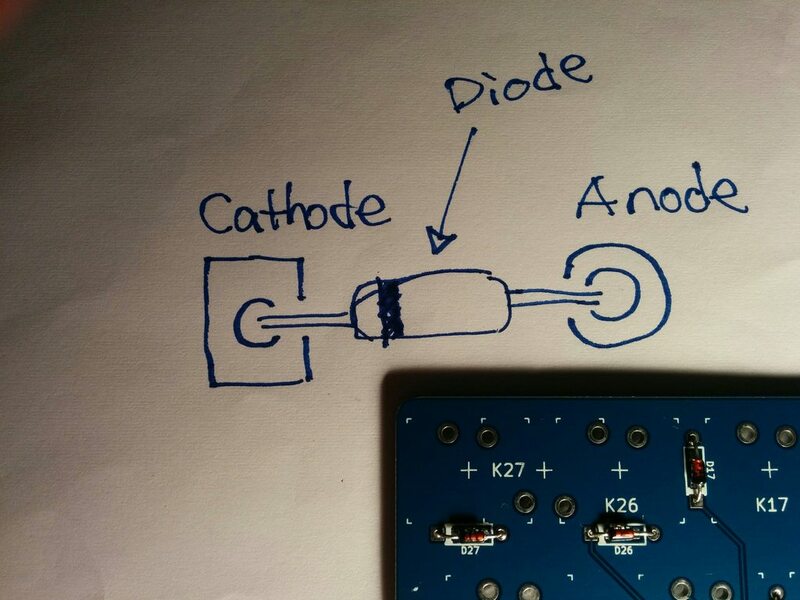 Diode has two leads, cathode and anode, you can discrimitate them by cathode mark on it. Black marking side of diode is cathode lead and cathode should be soldered on square land while anode on round land. 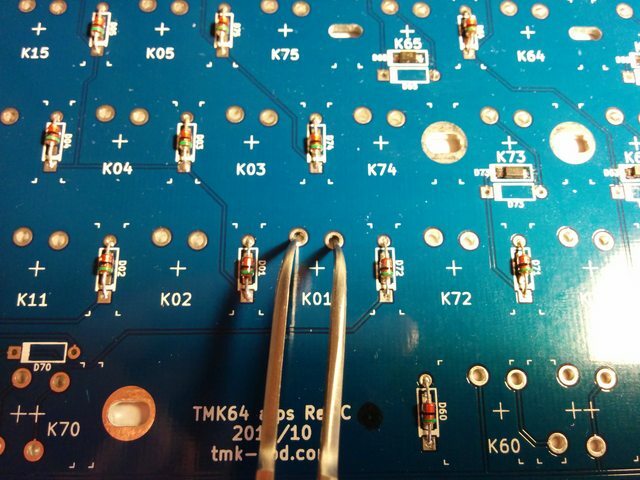 Don't solder diodes all at once, you should assemble some and test them at first to avoid losing your time in vain. Solder just a few diodes and check if they work correctly by short circuit like pic below. You will see the key only is registered on your OS, use Notepad, or tools like AquaKeyTest, EK SwitchHitter or xev. You can use SMT(SMD) diodes instead of through hole(TH) devices. Its footprint is SOD123, I tested PCB with DIODES inc. 1N4148W. 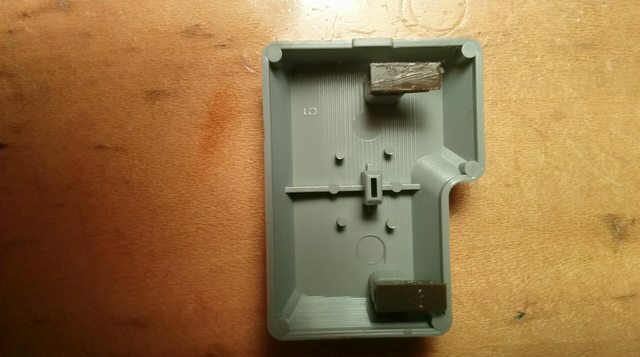 Some cases have thick PCB supports(standoffs and beams?) which interfere with some of TH diodes and make short circuit. To avoid this you can use SMT diodes for them(D00, D10, D20, D22, D23, D24, D25, D26, D27, D30, D31, D36, D55, D63, D65, D70, D73). And you will have to tape on TH pads to prevent from shortcircuit. Again, don't solder switches all at once, you should test them occasionally during assembly. At this point testing is easy, just plug in, press a switch and see with one of softwares above. After assembly is completed check if all switches work correctly with default firmware. Don't program controller with your firmware and don't change keymap until this test is finished. Your own firmware or keymap will make test/debug process difficult. To enter programming mode(start DFU bootloader) hook up to USB port and press tiny push button on bottom side of PCB. Consult with this wiki page to flash firmware. PCB is designed by KiCad. Design files are available here, you can check them to see its dimension and electric schematic. Components include micro controller, USB connector, x'tal, resistors, capacitors and diodes. Assembly service solders components on PCB excluding diodes, the axial diodes unsoldered are sent. You have to solder diodes yourself. 3a. if it works you pay for shipping, components(optional) and assembly fee(optional). 3b. if it doesn't work you have to give up your $10. Free free to ask your question. To order PM me and let me know number of PCB you will take. Later I will send you PM about payment. Please check the first post of the thread again before you order, in particular 'Caveat' section. includes unsoldered diodes(through hole device). You have to solder the diodes(and switches, of course) yourself. All SMT components except for the diodes are soldered on PCB by me. This includes blank/empty PCB and compoenents including diodes. You have to solder all components yourself. If you order two PCBs add $2. Add $1.5 per PCB to base cost $8.5. Note that shipping cost for a PCB is $10, not $8.5. - PCB design is not changed, quite same as first run(Rev.A). Changed to fix ISO enter problem and PCB is Rev.B now. - Assembled PCB are soldered all electric components except for diodes and swtiches. - You'll get unsoldered diodes(around 70) if you order 'Assembled PCB'. Diodes are for Through Hole, not for Surface Mount. - Raw PCB($12) is available but components are not. Please buy them from digikey, mouser or etc. and you can take components for $10. - Confirmed the PCB fits into Poker X, Poker II, Hammer Alu and Pure CNC case, but unclear about other cases including Pok3r and V60 at this time. See TODO section below. - Most of layouts are confirmed but 'Infinity bottom row' and 'bigass enter' are not tried yet. See TODO section below. - Order will be prioritized depending on the list. At this moment I don't know when next round starts but I made Google form for interest check. Fill in the form if you are interested in next round of this PCB and don't want to check this thread periodically. I'll let you know via PM when it starts. You don't necessarily have to fill the form to get PCB, use it if you need notice from me. Also check this IC by BlueNalgene. 19 PCBs are available from this run. PCBs and all components are already stocked and assembly will start in a few days. Please email to hasu@tmk-kbd.com to place order, let me know number of PCB and your paypal account if different from your email. Paypal Invoice will be sent to your email. You'll be able to make a payment with credit card on Palpal even if you don't have Paypal account. It will be shipped within two weeks after payment. 06/18 8 boards are still available. 06/23 3 boards are still available. 06/25 all board's gone. Thank you. It will be shipped in a week or two after payment. You can get a PCB or two. Only 10 plates are available. This plate is made with 1.2mm thick PCB/FR-4, not metal. It is not as firm as steel plate but it works. Its color is black. These are made by cheap PCB house in China, every plate has scratches, burrs or slight cosmetic imperfections. I think PCB plate works in the end but this idea is sitll experimental and not established nor reviewed in the community yet. Get a metal plate somehow if you want to avoid unexpected defect. You can add this plate to your order for $10 optionally. So PCB and plate cost $60USD(40+10+10) in total. At this time you cannot order only this plate without Alps64 PCB, sorry. See links below for pics and info. batch.1 will start shipping around Oct 14.
batch.2 will start shipping around Oct 31. Oct 11: All PCBs from batch.1 were claimed. Oct 11: Started shipping PCBs from batch.1. Nov 01: Closed batch.2 and leftover sale starts. Price is revised. Nov 17: All leftovers had gone. And PCB color is now green. For example, it costs $55 for a PCB and $104 for two. 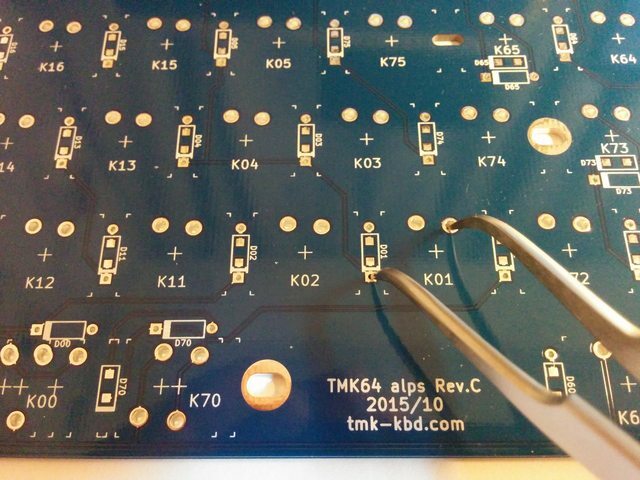 Please email to hasu@tmk-kbd.com to place order, let me know number of PCB and your paypal account if different from your email. Paypal Invoice will be sent to your email. You'll be able to make a payment with credit card on Palpal even if you don't have Paypal account. PM may not work for this GB, use email instead. Leftovers: will be available later. Jan 20: Shipping of Batch.2 was started. All orders were shipped as of Feb 10, if you don't receive tracking number email me. For example, it costs $52 for a PCB and $98 for two. The latest revision PCB color is green now. 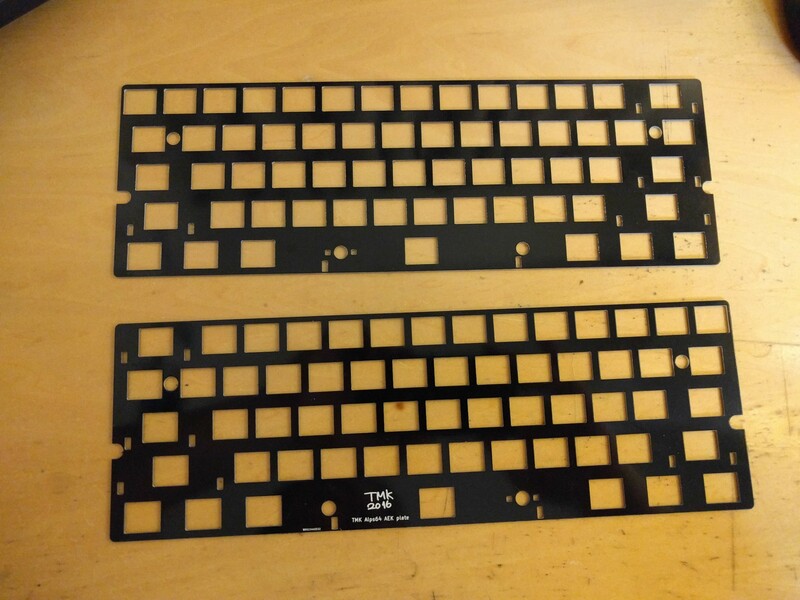 Please email to hasu@tmk-kbd.com with "Alps64 GB" in subject to place order and just let me know number of PCB(1 or 2). Paypal Invoice will be sent to your email, you'll be able to make a payment with credit card on Palpal even if you don't have Paypal account. Your shipping address should be supplied in Paypal form when payment. PM may not work for this GB, use email instead. If you are in a hurry you can get leftover from previous round, pcb revision is identical to 9th one. See below. 2017/06/05 started shipping earlier. All orders will be posted within two weeks. It costs $52 for a PCB or $98 for two. 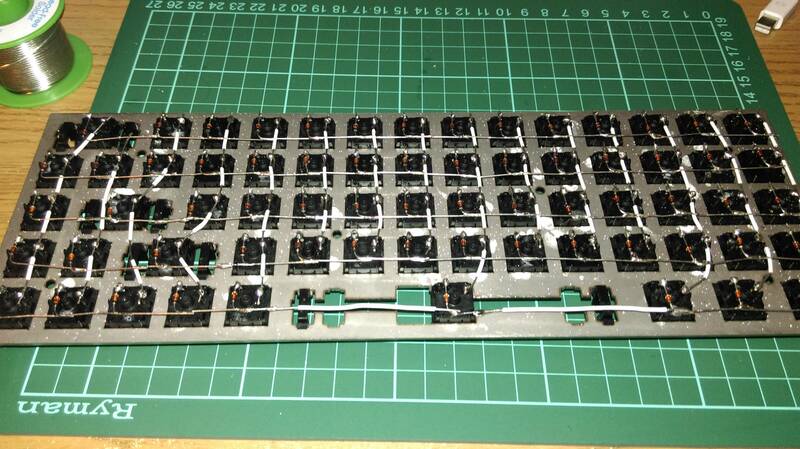 Please email to hasu@tmk-kbd.com with "Alps64 GB" in subject to place order and just let me know number of PCB/Plate. Paypal Invoice will be sent to your email, you'll be able to make a payment with credit card on Palpal even if you don't have Paypal account. Your shipping address should be supplied in Paypal form when payment. PCB and didodes: Components are already soldered on PCB(except for diodes). You will receive diodes(65-70pcs 1N4148, through hole components) and have to solder them yourself. PCB have breakouts for the three unused pins(C4, C6, C7) from current GB like pic below. PCB color is black in the GB. Also FR-4(PCB substrate material) plate for AEK layout is available. Its thickness is 1.2mm as spec and color is black too. It costs 12USD when buying with Alps64 PCB or 16USD when getting only plate without Alps64. Black Alps64PCB/AEK Plate looks like this actually, not matte black. The PCB looks like pic below. 1) It has Alps logo instead of TMK logo. 2) It has no breakout pads for unused pins(C4, C6, C7). Next batch of the pcb will be shipped until end of February. To place order email me( hasu@tmk-kbd.com ) with "Alps64 GB" in subject and let me know number of PCB and/or plate. I'm in for one with components assembled. I figure that at the very least, you should be able to cut some traces and make it work with a teensy if it's totally borked. I'm in for one with components, assembled. I'll be in for one with all SMD components soldered. I have a request hasu, would it be possible to add MX support as well, so that one can use both switches on the same board. I'm in for one with SMD components installed as well. Just to make sure you understand the mini-buy since you're requesting AEK fully assembled, the PCB supports several layouts. The assembled is the PCB with SMD work done. You will still need to provide the plate, switches, and caps and solder the diodes. I am in for one with components, fully assembled. Ok, good. I've seen people who had weird expectations before and wanted to make sure you didn't think you' be getting a fully assembled board. And it looks like with yours we hit 9 and Stabilized we hit 10. I'm in with all components soldered. Next project should be a TKL ALPS PCB board compatible with Filco/WASD cases. Anyone want to step up and run a plate GB for these? I'm in for one "Raw PCB"
If it can be made at BigBlueSaw and swill's plate configurator works right, I'd be willing to run it. Otherwise it would probably be too expensive locally since I'm in California. His tool doesn't have Alps stabilizer holes. But that's not a problem. I can design the plates. Count me in for one plus assembly. Alright, you design the plates and I can run the GB and get them cut through BBS. I'll probably look into local powder coaters and see what kind of pricing we can get there unless people would prefer aluminum. I could probably do it even cheaper locally if people wanted wood or acrylic plates. So, I was thinking. For salvaged keycaps, you can always just cut the plate from the old keyboard, as suggested in the OP. 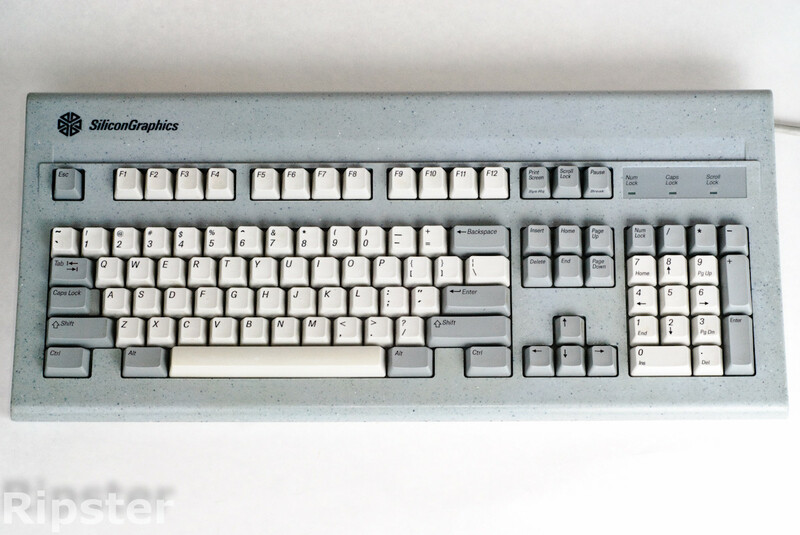 Should we make a plate with Alps holes and Costar stabilizers, to be used with keycaps from SP? Would there be enough demand to run a GB for a custom Alps keyset to go with these? There could be. I could also offer to do my MX to Alps convertors with it (once I confirm they work that is). Thanks a lot for your interesting, guys! EDIT: remove list. see first post. And plate GB is great idea! My original problem was source of keycaps, stablizers and mouning plate when I planed my ALPS 60% keyboard. Making good ol' AEK victim for these is my crude solution. But cutting plate is no easy task in particular with hand saw, it took half a day for me to cut AEK plate into 60% It was ridiculously time consuming job! If newly designed plate is available it would be way better. Let me know if I can help. Well I was going to butcher my AEKII but if we're making AEKII plates, I'm totally in for two of those too! Please add me to the list for 1 unassembled PCB with components. If you can help me figure out the specs for the alps stab holes I can add support for them. I wanted to add them, but I didn't know the spec to draw them. Doesn't have to be for this buy, but I would like to add that support. If possible, I'd like (out of laziness) change "Raw PCB" to "Assembled"
I would be interested in this GB as well! For both PCB and plate. So has anyone independently validated the pcb design? Hasu, can I ask where would you recommend finding alps switches in Japan? Is Yahoo Auctions the only place? Design review by others is really appreciated. I'm cross-checking dimension with using Poker compatible PCB designs like GH60 and Infinity. Any other designs publicly avaialable? stoic-lemon, you are right. Actually Yahoo is the only source. Any chance we could get stepped caps lock support? Specifically for supporting Silicon Graphics dyesub sets. Thanks for photos. I'll add support to stepped caps lock. I didn't know ALPS keyboard has stepped key. Good to know. hasu, I'm confused by the PCB! How many rows/columns are there? There seem to be 8 pins for columns and 8 pins for rows, at least that's how they're named. Some of the "rows" seemed to be connected to seemingly "random" switches. I named this PCB alps64. This indicates 64 keys on 8x8 matrix. haha thanks hasu, I missed the '64'! hasu does with 16 pins what takes most people 20! Can I get one raw pcb with components. Problem with Alps and stepped caps lock is that with various keyboards there are like 3 different step sizes. Can you remember those specific keyboards? Or links to photo would be very helpful. Thechemist, thanks for your interest. I don't know if you can get PCB, but added to the list. I'm also interested in one, assembled; if I'm not too late!